Let us do the work for you. We specialize in creating one of a kind promotional USB Flash drives and we believe there’s no better way to copy hundreds or thousands of drives than with our Data Loading Service. 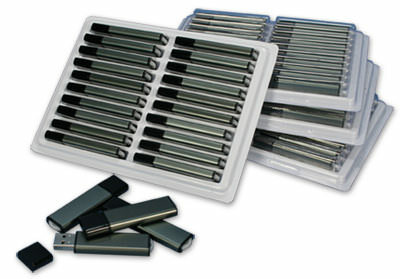 Our USB Duplication Services are a big time saver, especially in large quantities, and can save you money. 1. Send us your flash drive. Send information such as documents, movies, presentations, and more. 2. Pick your drive. We offer over 100 different styles of flash drives to choose from and our knowledgeable staff has the best equipment and experience to duplicate your content quickly and accurately. 3. We will produce identical copies and ship them back; it’s that easy. We can also pre-load your drives if you already have them at a very low cost. If you are in a rush, We offer Express Services to make sure you get your order when you need it.